A convenient way of dosing all of our Reef & Marine supplements in one application. 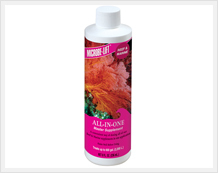 MICROBE-LIFT/ All-In-One Master Supplement is a newly developed proprietary formulation that was created to simplify maintaining reef environments. It has a strategically balanced ratio of the following 6 MICROBE-LIFT reef products: Chelated Iron, Essential Minerals & Trace Elements, Vitamins & Amino Acids, Calcium Concentrate, Iodide & Bromide, Strontium & Molybdenum. MICROBE-LIFT/ All-In-One Master Supplement is a time-saving product that is especially convenient and economically prudent for smaller reef systems, such as, "nano reef tanks" and bio-cubes".